Equipment list, options, technical specs. Alfa Amore now tells you everything you wanted to know about the Giulia QV. 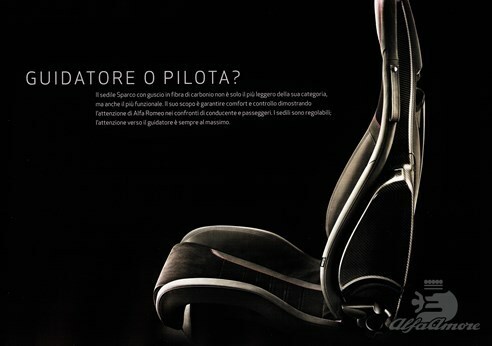 In the front the big scudetto defines mainly everything, and we have an active aero splitter, which opens automatically over 100 km/h. The drag coefficient is 0,32, which is the best in its class, the cargo volume is 480 litres. 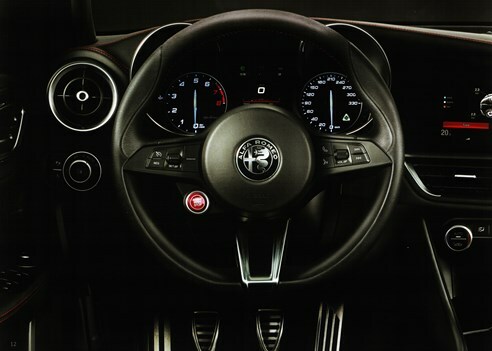 In the interior Alfa Romeo put’s the driver into the center: all the instruments are turned towards the driver. 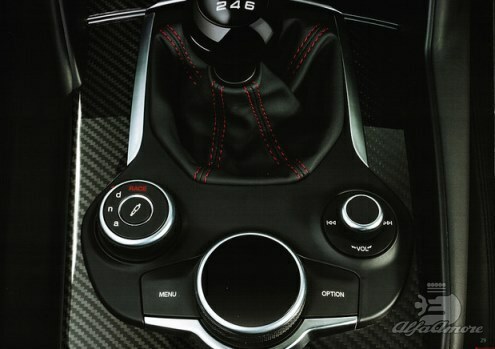 The brake and clutch pedals design is like the one we see on the scudetto. 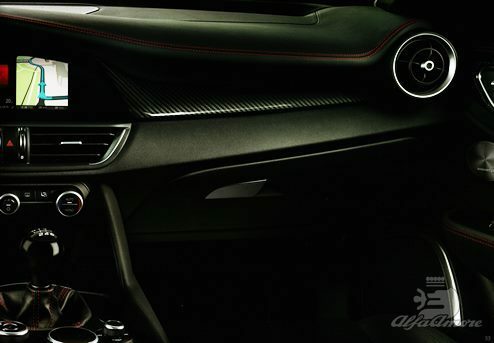 On the center console we can choose from a 6,5” or 8,8” TFT touchscreen, the seats are covered with leather or alcantara and are made optionally from carbon-fibre. The DNA switcher has a Race option, which strengthens the suspension and with the help of the sensors in the intake manifold, it boosts the sound of the engine in the interior. Switching to economy mode, the DNA switches down one cylinder bank to save fuel. The brain of the Giulia QV is the Chassis Domain Control, which handles the car’s vertical, horizontal and lateral motions and communicates with all the safety systems. Latter consists 6 airbags, forward collision warning, blind spot monitor, integrated brake system, lane departure warning system, parking sensors and cameras. 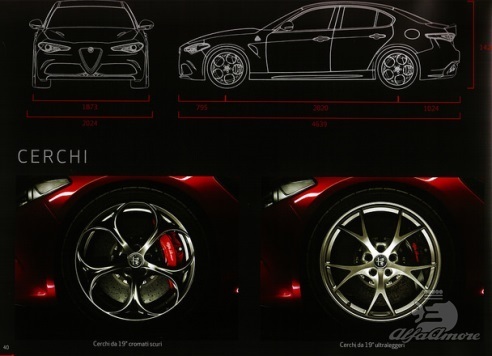 The suspension is fully aluminium, in the front we have a double wishbone system with a semi-virtual steering axis, in the rear Alfa used multilink and a sperrdifferential coupled with the torque vectoring system. You can find all the technical specifications on this link. We can choose the Harman Kardon audio kit, which comes with 14 speakers. The comfort package includes door handle lights, keyless door opening system and dimmed windows. The electronic seat package has 3 elements: 8-way electronic and heatable seats and steering wheel heating. 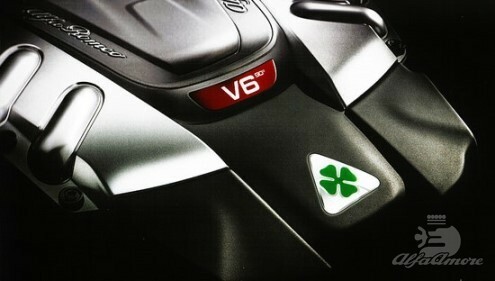 Beside these Alfa Romeo guarantees a 24 hour dispatcher service, and ensures courtesy car, and a Pick-up & Go service.